The trial of the leader of the Indigenous People of Biafra (IPOB) Nnamdi Kanu has been adjourned to March 2017. Kanu’s lawyer Ifeanyi Ejiofor who spoke to NAIJ.com said no reason was given by the court for the adjournment. Ejiofor said the matter has now been slated for Wednesday, March 1, for ruling on application filed by Kanu and three other defendants. Kanu and three others – David Nwawuisi, Benjamin Madubugwu and Chidiebere Onwudiwe – had asked the court to squash charges against them. Kanu in his application challenged the competence of charges leveled against him by the Department of State Services (DSS). Ejiofor said there is no material evidence against his client. 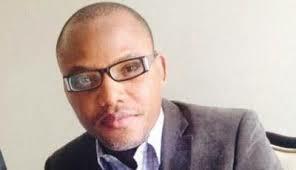 A Federal High Court presided by Justice Binta Nyako had ruled on the secret trial for Kanu and his co-accused. Nyako in her ruling had approved that witnesses who will testify against the defendants be protected behind a screen. However, contrary to Nyako’s ruling, Kanu and the three other defendants had vehemently rejected any form of protected trial. In one of the court session, the IPOB leader said, it is impossible for him and his fellow accused person to be accused in the open and tried in secret.